The unease set in after I was alone in the house. I had for years wanted to get a tattoo, and I had waited and waited until just the right design spoke to me, and just the right artist was available, and it was just the right time. Thursday was that day. When I arrived at the studio, I finalized the design details with Jersey, then Seth set about making it into a stencil. Once the stencil was applied to my arm I got to see really how cool it looked, and was pretty excited to get started. I sat in the 1960 vintage barber chair, reclined, and Jersey set the needles a-buzzin’. The first pass with the needle wasn’t so bad. The next few kind of stung, but after a few minutes the skin started to get numb and it was fine. I could really feel it when he had to make a wider line, and the needle stayed in that area a little longer. That one felt like he was scooping out a chunk of skin. The first break came after finishing the black outline. I got a chance to see it in the mirror, and it was still looking fantastic. The next step was adding the color, and after a total time in the shop of two and a half hours, I was looking in the mirror at the finished artwork. Exactly as I pictured it months earlier! After I got home I was hit with the second surprise of the day. Regret. I was overcome with regret and second guessing. When the realization hit that this was permanent, I couldn’t go back, and no matter how much I regretted it, there was nothing I could do about it, I was almost nauseous. Ellen came home from work, and I talked about it with her, and got some external validation, and the regret started to dissipate. My sleep Thursday night was very restless, with several tattoo themed dreams (and lots of tossing and turning). In the days since then, I have come to adore the tattoo. It is exactly what I wanted, has a lot of meaning, and is nice quality. I’m thinking that the first tattoo is the difficult one – I’ve already started thinking about what I want to get next. Everyone who has seen it has been overwhelmingly positive. Even the people that I never would have guessed would be supportive of it are. Special thanks to Ellen (for the inspiration), The_Kamikazen (for the design), and Jersey (for the ink). Also a shout-out to Seth, with whom I talked about meditation during our breaks (and who has a nice looking Om on his wrist). I chose a “happy buddha” (hotei) because it is a reminder to have a positive outlook on life – not to take it too seriously. He is juggling to represent keeping everything in your life in balance. One ball is on the ground because you can’t keep it all in the air – you have to know that it’s okay to set some things down. Juggling, besides being an activity that I enjoy, also requires you to be present in the moment in order to keep all the balls in the air. The lotus is the blue lotus which is a symbol of wisdom. The hotei sits inside the lotus as he continues to gain knowledge. The inside of the lotus petals are pink, symbolic of the “great buddha”. As the lotus continues to open, we move closer to the realizing the buddhahood that is in us all. The balls that are being juggled are colored in the same palette as a tradional prayer flag, each one representing the elements that make up our existence – the things we are trying to keep in balance. Blue (sky/space), White (air/wind), Red (fire), Green (water), Yellow (ground). The Design: The design has changed a little from the one drawn by The_Kamikazen. Most notably, the platform was replaced by the lotus. It was something that Jersey changed it on his own. It’s funny because that was the way I had originally visualized the design. Once I saw the hotei sitting in the lotus, the raised knee didn’t look quite right, so I had him change it to a lotus position. Jersey also replaced the large circle with a gradient glow. Everything else is still the same. Now that the tattoo’s done, it’s time to buy the t-shirt!! During that “in-between” time right after college (and before starting “real life”) I decided that I was going to learn to juggle. I suppose it was the beginning of my “bucket list” – I wasn’t going to die before I could juggle. I picked up a Klutz book and opened it up. The first direction: “Drop the balls on the ground. Get used to that sound, as you’ll be hearing it a lot.” Yep, they were right. But after some, okay a lot, of practice, I got it. Three balls. In the air. Not on the floor. Yay, me! This summer, I decided that I wanted to learn to juggle other things – like clubs. So, I picked up a set of clubs, and have been practicing with them. I’m doing okay – I keep them in the air more than I drop them, but I still get backaches from bending over to retrieve scattered clubs (true story). Although, it did prompt me to learn to do a real cool “kick-up” so I don’t have to bend over so much. I’m no juggling expert, and I’m no Buddhism expert, but I see a lot of connections. Juggling reminds me a lot about what attracts me to the whole Meditation/Buddhism universe. there are many distractions in your surroundings. To keep the cascade going, you have to acknowledge the distractions and let them go. you have to concentrate on what is in front of you, or it will fall apart. if you try to grab for the balls/clubs, the cascade will fall. You have to let them come to you. when you catch, you must do so gently. there are only so many things you can keep in the air. As you practice, you get better at it. when you are able to keep the cascade going, it’s a joyful experience. you have to let things go with the right velocity and rotation for them to arrive safely in your other hand. it takes a lot of practice to see results. In thinking about the design, I came up with the image of a “laughing buddha” to represent that joyful feeling of being able to keep everything in balance. 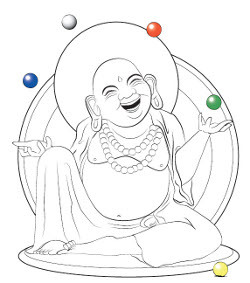 I chose five balls for him to be juggling, using the traditional colors of a prayer flag. I decided that one should be on the ground, as it’s impossible to keep everything “up in the air” and we need to decide what things to put down. Coincidentally, the one I had chosen to leave on the ground was the yellow one. Appropriate! I had this image in my mind of what it would look like, but hadn’t done anything about it yet. I then started sitting with the Online Meditation Crew, and saw that The Kamikazen was designing twitter avatars for some of the crew members. I asked him if he would like to take a stab at this tattoo design. Much to my surprise, and excitement, he said yes. This was almost exactly what I was seeing in my head, with a little Kamikazen twist to it. All the avatars that The Kamikazen had designed he turned into t-shirts that you can purchase. This one is no exception. You, too, can have this way cool design on a t-shirt (or a hoody, or long sleeve tee, or onesie, or a sticker), just by following this link*. Proceeds from the sale of this t-shirt (and the other ones in the store*) go to charitable causes, so buy a couple of them! Just when you thought it couldn’t get any better, it does! Notice on the t-shirt there is some text below the design. It says, “Balance…It’s all up in the air.” This perfect tagline was added by the OMC’s founder ZenOutlaw!! What a great collaboration – thank you KamikaZEN and Zen Outlaw! *Update (9:00pm) – moments after I published this post, The Kamikazen announced the launch of the official Online Meditation Crew store. The link in the article works (as of this writing), but for the latest up-to-date stuff go here: I Want My OMC Gear! or, you can go right to the page with the Juggling Buddha. Update (again) (9/13) – Just released!!! The Juggling Buddha in color!! Get yours now!